Speer ammunition is favored by police officers and concealed carriers for its proven performance in self defense emergencies. 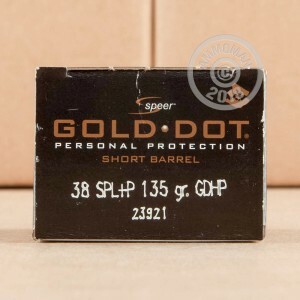 This .38 Special +P ammo from Speer's Gold Dot series is a formidable carry load for your .38 SPL revolver. Gold Dot bullets are formed with a molecularly bonded jacket and core that will expand reliably without separating to ensure optimal energy transfer (and stopping power) against an assailant. Each cartridge in this box of 20 propels a medium weight 135 grain version of the Gold Dot to a muzzle velocity of 860 feet per second. This results in a good balance of expansion and penetration. 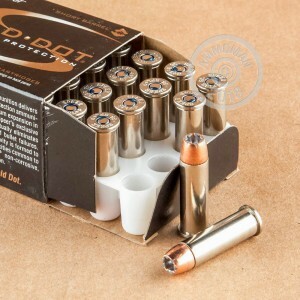 As a +P load, this ammo produces above average recoil for its caliber and should only be used in revolvers rated for the additional pressures. Note that all .357 Magnum handguns can safely fire this ammunition with no problems. Speer Gold Dot ammo is loaded in Lewiston, Idaho using non corrosive Boxer primers and nickel plated brass cases.